With so many social media tools and tactics to choose from how do you know what’s best to promote your brand? You’re not looking to simply follow the hype, right? Better to go with well-researched data regarding the reality of the many social media options. Learn about true-life success stories (and failures, to avoid making those same mistakes). Figure out what fits your situation and use that information as a guide. 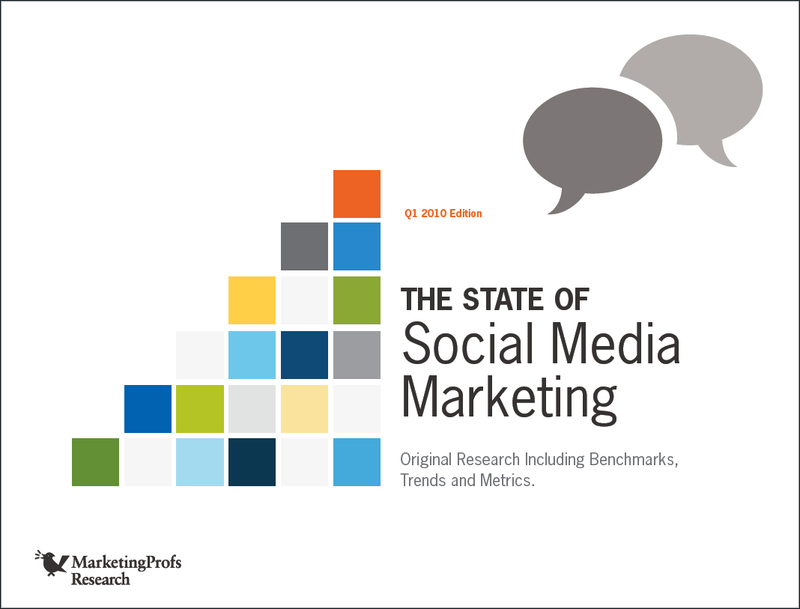 Well, for starters, there’s a new report by MarketingProfs called The State of Social Media Marketing. Based on survey results from 5,000+ professionals, it covers a lot of ground, to include budgets, benchmarks, metrics, trends and most/least effective strategies. The 242-page report comes chock full of graphs and charts. It’ll keep you busy for a nice while. Meantime, I asked Tim McAtee, MarketingProf’s director of research, to provide a little peek under the covers. He most graciously obliged with this illuminating Q&A interview, which hits on a number of key areas addressed in the report. There are plenty of marketing surveys out there, yet you claim yours is different and is more nuanced. Can you elaborate? We have a much bigger sample than other studies, which means aggregate trends are more likely to be accurate, and there are enough respondents to look at really specific smaller cuts of the data and still have projectable findings. We acknowledge that there is a difference in voice when it comes to social media—the voice of “the corporation”, “the worker”, and “the person”. We all put on different hats at different times and use social technology very differently depending on which of these voices we’re using at the time. It’s really important to acknowledge that and to structure survey questions to allow for that difference to be shown in the data. Because social media is a very human endeavor, we tried to think about it in very human terms. For example, we looked at personality types and corporate culture to see if there was correlation between these and social media usage and success (there was). Also, instead of just asking about social media budgets, we asked about time-spent with social media. Can you explain the methodology – how was the survey conducted? Tim: The core of the study is a survey sampling our base of 300,000+ MarketingProfs members. Most studies go out trying to find social media users, then ask them about usage. This creates an imbalance in the data from the start. It’s all numerator, no denominator. We survey as many marketers as possible regardless of social media use to get a better sense of who is not using social media, and why, in addition to who is. Out of the 5,140 marketers we asked, about 70% are using social media for work purposes. In addition to this survey data, we pull in outside panel data to look at consumer usage of media and technology. For this study, we turned to ComScore for up-to-date numbers on usage of a variety of social websites and tools both in the US and globally. You surveyed the relationship between corporate culture and social media success — what did you find to be the most and least ideal type of culture for social media support and success? Tim: The one consistently negatively correlating corporate culture across all types of success metrics was “prefers to maintain the status quo”. On the positive side, a willingness to have “honest internal dialogue about marketing successes and failures” was often key. However, it’s not quite that simple. Companies with nothing to hide did well with more open marketing tactics like unrestricted employee blogging, while highly secretive companies did well with more controlled tactics like PR and managed communities. In other words, companies should be fitting the right tactics to their culture, not revamping their culture to keep up with irrelevant tactics. What about B2B vs. B2C – what are the major differences as to how these two market sectors are approaching social media? Why do you think this is so? Tim: I think the difference is really just one of reach and target audience size. Consumer-facing companies tend to favor direct communication with large numbers of people, while business-facing companies focus more on the quality of a short list of contacts. The tactics you use to promote building the size of your lists vs. nurturing a small list are very different. The one thing both do well is to use social media to listen. Spending for social media is growing. Where do you see the biggest increase – what aspect is getting the most attention expense-wise? Tim: Expense-wise, the biggest cost has to be employee time. After that, probably analytics. Automating the listening and customer-service aspects of social media is key to scaling up corporate usage of these platforms. What did you find out about the true cost of social media? Tim: There’s kind of a gray-market of social media work going on. 60% of marketers using social media at work for work purposes aren’t actually paid to do so—it’s not “technically” part of their job. I think the true cost of social media is hidden. Are companies now creating new roles specific to social media, or is it still more an add-on to other responsibilities? Tim: It’s more of an add-on responsibility at present. Who does what depends largely on role. CEOs are often staying late to blog and tweet and generally maintain the thought-leadership aspects of social media, while PR people and customer service people are suddenly trying to handle complaints on Twitter, blogs, Facebook, etc. Ideally, companies should be creating roles and guidelines regarding who does what when it comes to social media to ensure that strategic goals are being met and employee time is spent wisely. In other words, the CEO shouldn’t be handling complaints on Twitter, and some junior PR person probably shouldn’t be blogging on behalf of the corporation. If it’s more an add-on, does that short-change social media efforts? Or is this indicative of how social media needs to be integrated into marketing, as opposed to being seen as something separate? Tim: All media is becoming social. It’s inextricable. Smart people need to figure out how to make the best of it. The hard part will be sorting the signal from the noise. That’s why it’s so important to have analytical systems in place. Are three crazy people complaining about your product on Twitter or is this a groundswell you need to pay attention to before it develops into a mass-media news story that does lasting damage? Should you route information coming from consumers to your R&D department, your customer service department, or your PR department? As these new channels open up, companies need to adapt their existing internal communication systems to handle input from unexpected sources. You have a section devoted to “Most and Least Effective Social Media Tactics and Strategies” – can you give a top level overview of these findings? Tim: Listening works very well, broadcasting often doesn’t. Targeting niche groups with highly relevant information is much easier and effective when you know who you’re talking to. I loved the question: “What are some commonly used but counterproductive social media tactics.” Can you offer some insight about the most telling responses? Tim: Counter-productive tactics mostly have to do with using social media platforms like broadcast platforms. Dialogue is a lot more work than monologue and most marketers aren’t prepared for that. They present their broadcast message which either falls on deaf ears because no one cares, or people do care, respond, and the marketer is suddenly swamped with thousands of responses they can’t handle. A section of the report covers the topic: “Do Social Media Workers Think Differently? Differences found in the values and personalities of social media workers.” That one sounds fascinating. When you say differently, how do you mean– different from what? And then, what did you find out about how social media workers’ personalities and other characteristics may differ from other marketers (or maybe they’re the same, after all). Tim: We looked at Meyers-Briggs types and values statements, then compared them to social media usage to see where differences arise. We found that there were more similarities than differences, but that those most involved in social media professionally do indeed over-index on very specific personality traits, such as the desire to mix their work and personal lives. Based on some spikes in the data, Intuitive Extroverts that are not perfectionists, but will “roll with the punches” seem to be the best fit for social media marketing, especially when they are already doing a job that involves a lot of writing. Did any of the results surprise you? Anything that stood out and made you think “wow” now that’s really something? Tim: What surprised me the most was how complicated the results were. There are really few trends that apply to all types of people or all types of companies. The learning curve for figuring out how to incorporate and take advantage of social media at the corporate level is much steeper than I expected. If you had to narrow it down to two big takeaways from this report, what would they be? Social media seems inevitable, so every company needs to be adapting their current business operations to factor in these channels of communication, including paying people to work them. Figuring out your social media strategy is far more important than immediately enacting a bunch of social media marketing tactics. Don’t listen to anyone advocating one-size-fits-all social media tactics, with the exception of using social channels to listen—everyone can benefit from that. Instead, map tactics back to an over-arching strategy that makes sense for your company and your customers. How do YOU see the state of social media marketing? Does it fit what you read about here, or is it different? Please share your thoughts and experience.